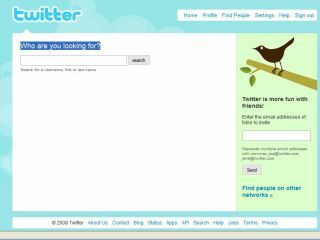 Twitter has finally added a people search function to the website. It's surprising that a site this successful managed to get by without this type of functionality, but this belated function now means that you can search for fellow tweets by their real names. Crazy. First impressions of the search have not been great. Some users have found it to be a tad buggy, throwing up random names rather than the one you actually searched for. In our tests, it seems that the search is caps sensitive – take off the caps, and as long as the person you are looking for is a Tweet, then you should be able to find them no problem. You can either search for names in the main search bar or go to the new, dedicated 'Who Are You Looking For?' option. New research conducted by internet marketing company HubSpot has found that between 5,000 and 10,000 people a day are signing up for Twitter daily, so this function will come in handy in the rapidly expanding Twittersphere. The micro-blogging site hit the news this week when one user Tweeted his account of a plane crash - which he was in.